20+20 was approached by the newly established Women’s Legal Service in Burnie to curate some artwork for their offices. We jumped at the chance. We met with key staff from the Women’s Legal Service to develop a project brief and create a shortlist of creative ideas about what the space could look like. A bunch of 20+20 participants then worked together to produce a large mural for the space, projected and painted onto a series of canvasses using design imagery from the Project O event Colourathon. We thought it was cool to have a link with Colourathon – which focused on family violence prevention- and the Women’s Legal Service. And we hope the vibrant imagery makes the Legal Service feel like a safe place for people accessing the service. 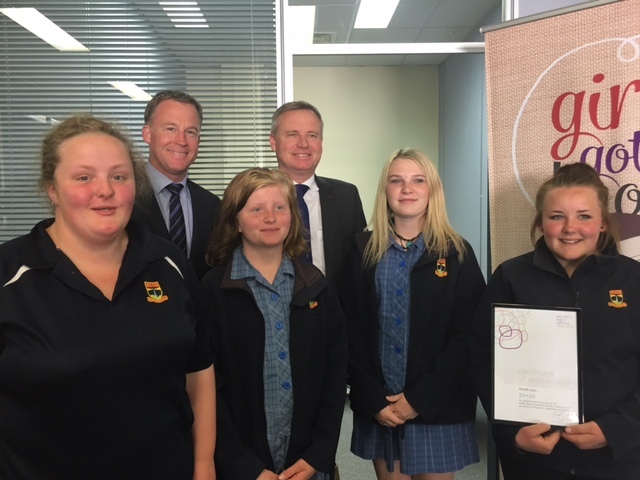 We also attended the offical Women’s Legal Service launch where some of us gave a speech and we got to hang with Tasmanian Premier Will Hodgman and Jeremy Rockliff. Cool stuff!